Records updated as of October 2018. 12 so far this year. Nicky got another one this weekend! Find them under the Menu: Club Info. Please inform Don if there are any errors. Thank you. 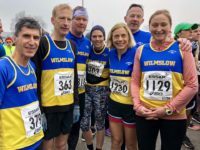 Records Broken at Trafford 10k. Both Nicky and Mick achieved club records with their run at Trafford on Sunday [2nd Sept] with times of 46:47 and 42:20. Congratulations to both of you. Club records updated on Club Info menu. Ian’s 2:54:35 at Chinley was the slowest time in a Summer Series race. The quickest was Damien, 15:04 at Bowdon in 2010.